It’s that time again! Please help pick themes for the regular season StorySlams. The following list was generated by the Slam Lords (a.k.a. Programming Team), a group of volunteers who plan our monthly Slams. They selected these from a master list of themes suggested by audience members. Now, they’d like to hear what you think so please vote! Ask you review, please ask yourself: Can I come up with at least one true story from my life related to this theme? We want themes that are broad enough to allow for a variety of narratives and emotions yet specific enough to inspire lots of stories. Yep, it’s a tough balance! 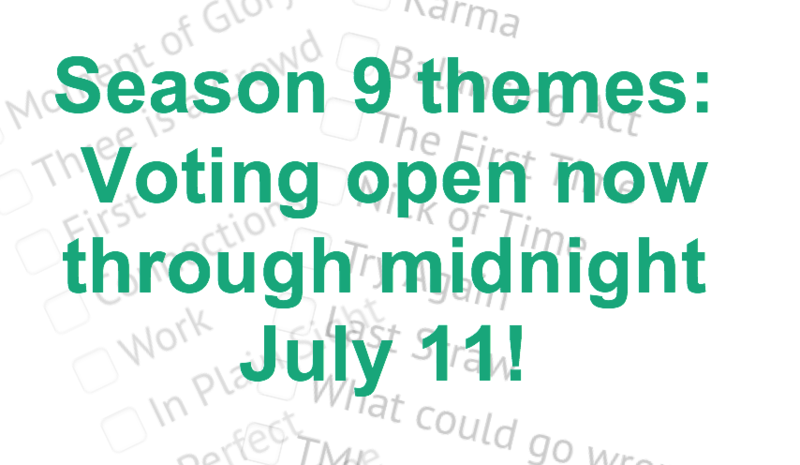 Once voting closes, we’ll use as many of the top rated themes as we can. Last year, we managed to use 7 of them! The others were selected in conjunction with Event Partners, so in the end, all the themes come from the community. 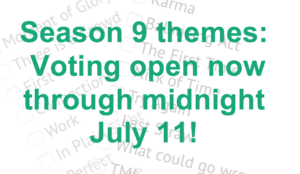 We're picking Season 9 themes! Which themes make you think of lots of personal stories? Vote for up to three. Poll closes July 11! Note: this poll only allows 1 vote per ip address, so if the poll isn’t working for you, that’s probably why. Try voting from another computer or device – and if that’s not possible, contact us and we’ll figure something out. Have a theme that you’d like us to add to the master list? Use this form to submit it! Subscribe me to the Ex Fabula mailing list! Meet Ex Fabula’s New Event Producer, Kennita!